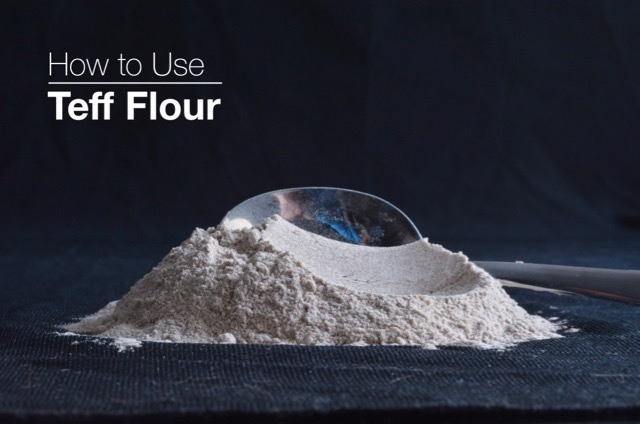 How to use Teff flour is #8 in my monthly blog post series on gluten free flour and what I consider the best uses for each one. You can see the full list at the bottom of this post. The idea is to learn to use the flours you like, to make foods you enjoy. As you notice what kind of recipes you like to make in your own kitchen you can focus on them and improve your results. Teff is an ancient grain originating in North Africa. It is a tiny grain, the size of a poppy seed, and is packed full or nutrients and fibre. When ground into flour it is used in the well known flat, crepe-like bread Injera. This naturally gluten free bread is served at every Ethiopian meal and is used in place of a fork to scoop up food from communal dishes. For gluten free bakers the high protein content in teff flour helps provide structure in baked goods. Teff also has a deep brown colour and a mild, earthy flavour with hints of molasses. Together this results in baked goods with a dark colour, a hearty chew and a wheat-like flavour. I first heard of teff flour from Shauna Ahern of the Gluten-Free Girl and many other cookbooks. Shauna is a serious and trustworthy gluten free baker so when she raved about the taste of chocolate chip cookies made with teff I immediately bought this flour. I’m a sucker for a good chocolate chip cookie. This is the recipe I posted, Chocolate Chip Cookies with Teff. Whole teff and teff flour can both be found at health food stores. Bob’s Red Mill and Maskal are popular brands of teff flour available online. I made these chocolate chip cookies a few times then I added that teff flour to that bucket The bucket in my cupboard that is sometimes over flowing with different gluten free flours. That bucket that needs to get cleaned out every once in awhile. I never really experimented with teff flour beyond those cookies. But since writing about all these different flours I am inspired to use my teff flour, experiment with it in recipes and use it up first. Then probably buy some more and keep going. Do you have a bucket of different flours in your kitchen? I am not trying to pay attention to all the many flours in my cupboard and use them in some of the recipes I make frequently. These Chocolate Chip cookies with teff are the only recipe I have posted. Injera flat bread requires a sourdough starter and takes time. If I was going to make it I think this recipe from Cultures for Health looks like a good place to start. I always experiment with my basic Banana Muffin recipe. It calls for a total of 1¼ cups plus 2 Tbsp of flour. Start by substituting the 2 Tbsp with teff flour in this recipe and see how you like it. Work your way up to ¼ cup or more and see what you learn. These Chocolate Cheesecake Brownies have a delicious, fudgy base and they are on my list to try with teff, maybe even without the cheesecake topping. I’m going to swap the quinoa flour for teff and see what happens. My recipe for waffles calls for 2⅔ cups of a flour. I can only eat so many waffles but I would start by using ⅔ cup teff flour with 2 cups of my usual gluten free flour mix. Let me know in the comments below if you got inspired to try teff and what you made with it. This is the eighth in a series of blog posts on gluten free flours. My intention is to provide a basic overview of several gluten free flours for the everyday home cook, both new and experienced. Let me know in the comments below if you have a specific problem with your baking or a tip you’d like to share. Thanks for sharing your recipe Caroline. I will give it a try! I haven’t baked with ground chia seeds but I have some so I’ll grind them in my coffee bean grinder (a hint of coffee won’t hurt the taste of pumpernickel bread). Your picture looks great and the spinach dip is always a winner. I have a nice pumpernickel bread i bake in round stone pots from the Dollar Strore. Here is my recipe that uses teff: https://applewoodrecipes.com/2016/03/23/gluten-free-pumpernickel-with-spinach-dip/. This is my blog with recipes i have developed over 20 years baking gluten free.